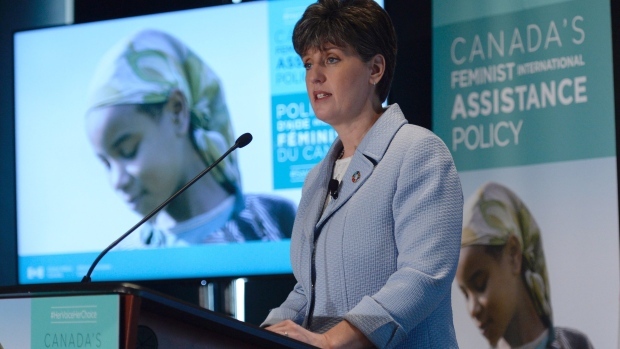 The Honourable Marie-Claude Bibeau, Minister of International Development and La Francophonie, today launched Canada’s new Feminist International Assistance Policy. The new vision lays the foundation for positioning Canada as a leader on gender equality in its aid programming. Canada believes that advancing gender equality and promoting equal rights for women and girls is the most effective way to reduce poverty. This vision is the key to growth that benefits everyone, and it will also help us achieve the Sustainable Development Goals. Canada has a long-standing commitment to helping the poorest and most vulnerable, particularly women and girls around the world. Moreover, Canada believes that society is more prosperous, peaceful, secure and united when women’s rights are respected and women are valued and empowered in their communities. That is why gender equality will now be targeted and integrated throughout Canada’s international assistance. In taking action in these areas, Canada will advance a more flexible, innovative and integrated approach toward achieving gender equality and addressing the root causes of inequality. This approach also aims at reducing poverty, building peace and addressing humanitarian crises in the world’s least-developed countries and among its most vulnerable populations. In support of Canada’s new Feminist International Assistance Policy, Minister Bibeau also announced today the new Women’s Voice and Leadership Program. As part of this initiative, the Government of Canada will allocate $150 million over five years to respond to the needs of local women’s organizations in developing countries that are working to advance the rights of women and girls and promote gender equality. This will make Canada a leading donor in supporting women’s rights organizations in developing countries. Canada’s new vision builds on the evidence gathered during the 2016 International Assistance Review. As part of the review, the government engaged a wide range of partners, including Canadian NGOs, donor and partner governments, youth, people in developing countries and experts in the field of international assistance. The government will continue to engage its stakeholders, both in Canada and abroad, to effectively implement this new feminist policy. 15, 000 people, mainly Canadians, participated in the 2016 International Assistance Review consultations in 65 countries. Within 5 years, investments in programs that will specifically target gender equality and the empowerment of women will represent 15% of Canada’s $2.6 billion bilateral development assistance, up from 2% in 2015-16. All projects, in all sectors, will now have to integrate gender equality and women’s empowerment. The new Women’s Voice and Leadership Program will allocate $150 million over five years to respond to needs of local women’s organizations in developing countries that are working to advance the rights of women and girls and promote gender equality. This will make Canada a leading donor in supporting women’s rights organisations in the developing countries. Canada will ensure that no less than 50% of its bilateral assistance is directed to sub-Saharan African countries. Filed Under: AFRICA, ASIA, CANADIAN, Canadian Events, CARIBBEAN, CENTRAL AMERICA, EURASIA, EUROPE, FORMER SOVIET UNION, GLOBAL EVENTS, Government Speaks to our Women, MIDDLE EAST, NORTH AMERICA, OCEANIA, RADIO, SOUTH AMERICA, Uncategorized, WOMEN GENDER EQUITY ISSUES, WOMEN of HISTORY, WOMEN that "Share in Positive Action" for Our World!, WORLD EVENTS, YOUTH of ACTION™ Tagged With: A Celebration of Women, acelebrationofwomen.org, CANADA, Canada launches new Feminist International Assistance Policy, Canadian government, Canadian women, global affairs, government policies, international, Minister of International Development and La Francophonie, The Honourable Marie-Claude Bibeau, woman, women.